So, you have been in your home for a few years now, and have begun to feel okay about the interior. There is fresh paint on the walls, you have ripped up that wall to wall carpet (and the years of dust baked into it), and finished the hardwood underneath. There has even been enough time since the closing for you to have experimented with some different room layouts and you feel settled on the current one and the personal touch you have put into the design elements. You are happy with your work and feel a great sense of accomplishment. But then, a realization sets in. Anyone who looks upon your front yard from the street would have no idea of the hard work you have done! It is three different shades of green, and innumerable lengths. There is a hilly section in the middle, a valley just before the flower bed closest to the house, and each time you walk across it, you nearly trip in the various divots and fissures hidden away by overgrowth like bear traps. It doesn’t just look unsightly. It is a dangerous sea of potential turned ankles as well as a great conduit for a literal sea in your basement. It is time, you decide, to take on the task of leveling and reevaluating the optimal pitch of your yard. Here is the best way to go about it and everything you will need in the process! The first thing to do is to mow the grass. You want to cut your lawn down as far as you can without revealing the grass blade stems. If you go too short, you run the risk of killing the grass completely. Thatch refers to the decayed clippings and other earth material at the base of your grass stems. This is the stuff that gets stuck and sort of woven into your lawn. You may think this is just a part of your grass, but if you have a particularly thick and rough path of lawn, it is because of thatch. This needs to be remedies ASAP. To do this properly, you will need a little more muscle than your average leaf rake can provide. A thatch rake is characterized by the sharp teeth omitted from both sides of the rake head. Use one side for breaking up the thatch and the other side for removing it. If there is more than half an inch thatch between the grass and the soil, you will need to dethatch. By evaluating where exactly the thatch has become a problem, you can save some time and energy, attacking those areas specifically. That said, if a large portion of your yard is riddled with thatch, you may want to use a machine for dethatching. Once you have dethatched, you will begin to bring up the low sections of the lawn or filling any large holes or fissures. Do this using a mix of compost, topsoil and sand. A good ratio is one part compost and two parts sand and topsoil for however much total material you will need to reach the desired lawn level. The purpose of the sand is for keeping the desire level intact. Sand works great for this because it does not compact easily. The topsoil and compost are rich in nutrients. Adding them to the mix creates a fertile environment in which your grass can grow and thrive long term. 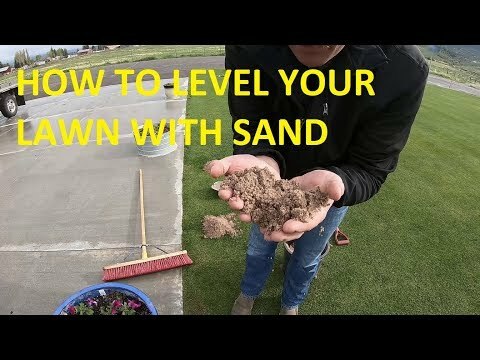 If there are holes or low points deeper than a few inches from level, you will want to remove the sod from the top before filling with the sand/topsoil/compost mix. Use a shovel, entering the side of the area and piercing just enough so that that sod stays in tact in one shovel full. Fill the area you have removed, than replace the sod. Once the lowest sections are filled, sprinkle the top mix across the remainder of your yard at about ¼ inch thickness. You may think you need to spread more of the mix to even off the yard in certain areas. Placing a more concentrated mix into one particular area could choke the healthy grass there. Rather than adding extra shovel fulls to those areas, make a second lap of spreading. This is just a good practice in ensuring even, breathable amounts of the mix. Once you have thrown down the mix, work it into the grass with especial focus on those gradual low sections you’ve worked to built up using a rake. The bow rake is the metal toothed rake typically used for leveling gravel or sand in patio projects. Its back end is a straight, flat edge perfect for moving small loose material like your topsoil mix. Follow this process by making a pass across the yard with a push broom. The goal here is to move the material around but not to leave it covering the blades of the grass completely. The push broom will help to work the blades free of that material, so the topsoil can fall through to the roots where it can best do its job and so the existing grass can breathe. 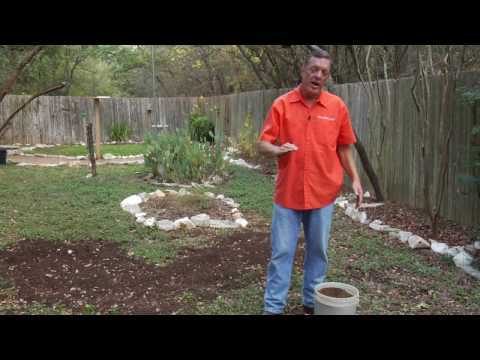 Once the topsoil mix is evenly distributed, water the lawn. Adding water will fill any empty pockets in the lawn with the fresh, fertile material to encourage a thriving green yard next season. Wetting the mix will also put the nutrients to work faster. If you notice settling after water application, or that there are some areas that can still use some bolstering, you can repeat the topsoil mix application process. Don’t apply until that first layer of mix has been absorbed and some new grass has begun to sprout. You will know this is the case when the mix is no longer visible at the roots of the grass. Follow the steps outlined above to ensure that next season you can be proud of the site of your lawn, and aren’t just bearing it. A level and well pitched yard will not only defend against poor curb appeal and the occasional turned ankle, but will also allow you to take back control over the direction of running water. For defense against water damage, and a welcoming wiffle ball field for years to come, this process is full proof.